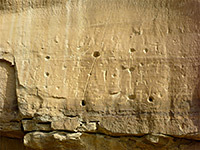 The very remote Chaco site of northwest New Mexico has the largest, best preserved and architecturally advanced of all ancient Southwestern villages, equal in importance to Mesa Verde in Colorado and although lacking the dramatic cliff alcove setting, the ruins here are made more evocative by the great desolation and emptiness of the surrounding countryside. This part of the state is mostly flat, sandy desert crossed by only a few little-used tracks, very sparsely settled and with no prominent geographical feature for many miles. Only a few low gorges and mesas interrupt the general flatness, and the prevailing aridity plus the long winters experienced by this relatively high location (6,200 feet) make this an odd place for what was a large and advanced civilization to develop. 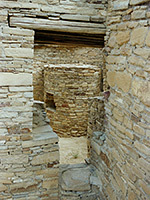 But for 300 years the Anasazi Chacoan villages - most based on a single walled enclosure with hundreds of inter-linked rooms known as a great house, were at the center of a network of roads and outlying settlements that extended 100 miles to the south, west and north, and include a few others also well preserved today like Aztec Ruins near Farmington. There is only one main road to Chaco Culture National Historical Park, though this is not the one shown on most maps - for many years access was along state route 57, an unpaved road that leaves US 550 at Blanco Trading Post (and is still used to reach the Ah-Shi-Sle-Pah badlands), but this is now replaced by CR 7900 and 7950, starting further south along US 550 near Nageezi. The drive to the park is 21 miles, along bumpy, often heavily graded gravel or dirt tracks with several T-junctions, which luckily are well signposted, and past just a few Indian houses amidst sandy, arid mesas and scrubland - part of the Navajo Reservation. In recent years the last 4 miles have become rather rough due to lack of maintenance, especially either side of Escavada Wash, and may be impassable after rain, but any vehicle driven with care can usually reach the park. Road 7950 descends into a shallow canyon (Gallo Wash) becoming paved at the park boundary, passes the campground and a few small ruins then enters a deeper valley up to one mile wide. This is Chaco Canyon, where all the important ruins are found; ten major sites, most of which are right next to the 8 mile (one way) loop road running beneath the crumbling, yellow/brown sandstone cliffs that enclose the valley. It is a short drive but there is a lot to see, and about half a day is needed to explore the closer villages or a full day including hikes to some of the more distant sites on top of the adjacent mesa. There is one other way into the park from the south, along sandy road 57 that runs quite straight through more empty, wide-open desert land for 19 miles to the next paved highway, Indian Route 9. This is less maintained that the northern approach, bumpy in places but still generally quite good, though not advisable during wet weather when the surface becomes too muddy. In addition to ruins within the main unit, the park includes three outlying sites (Pueblo Pintado, Kin Bineola and Kin Ya'a), the last two of which generally need a 4WD vehicle to reach. 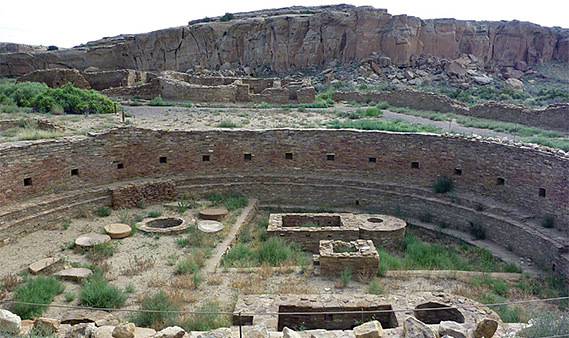 The Chaco Canyon area was first inhabited in the middle of the ninth century and reached its peak importance about 200 years later, by which time the population reached 4,000 and over a hundred satellite villages had been constructed across north New Mexico. 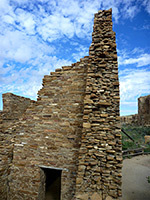 Trade routes were opened up with more distant settlements in Colorado, Arizona and north Mexico, and yet as with all other ancient civilizations in this part of the Southwest, the thriving Chacoan colony declined rapidly and all the great houses were abandoned in the late thirteenth century, though this site in particular retains great significance to many modern Indian tribes. 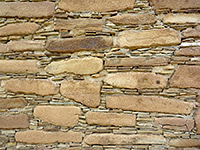 Chaco became part of the national park system (as a national monument) in 1907 and was designated a World Heritage Site in 1987.